E-mail written 2007 to Warren Culpepper from Charles Andrew Grigsby, England, e-mail address. Transcribed the will of Sir Anthony Culpeper of Bedgebury from the PRO images. "England, Kent, Canterbury Parish Registers, 1538-1986," database with images, FamilySearch (https://familysearch.org/ark:/61903/1:1:QGNL-KMJQ : 13 March 2018), Thomas Culpeper, 11 Apr 1643; from " Kent, Canterbury Archdeaconry Parish Registers Browse, 1538-1913," database and images, findmypast (http://www.findmypast.com : n.d); citing Burial, Hackington, Kent, England, United Kingdom, Citing Canterbury Cathedral Archives, England. Thomas Culpeper (1637-1708). colonel, was the only son of Sir Thomas Culpeper, knight, lieutenant of Dover Castle; and of St. Stephen's, otherwise Hackington, Kent, by his wife, Lady Barbara, daughter of Robert Sydney, earl of Leicester, and widow of Sir Thomas Smythe, K.B., first viscount Strangford (Hasted, Kent, fol. ed. iii. 595-6, iv. 76). Born, according to his own statement, on the Christmas day of 1637, he lost both his parents six years later. He lived as steward with the Strangford family. With his half-brother, Philip Smythe 2nd Viscount Strangford, he busied himself in promoting the king's return, and was imprisoned by the council of state in August and September 1659 (State Papers, Dom. 1659-60). In 1662 he married Frances, third and youngest daughter of John, lord Frecheville, of Staveley, Derbyshire, by his second wife, Sarah, daughter and heiress of Sir John Harrington, knight. It was a stolen match, and so displeasing to Lord Frecheville, that, while outwardly reconciled, he refused to make his daughter any settlement. At his death, in March 1682, he left her an annuity of £300, which owing to the reduced state of his fortune was probablv never paid. Lord Frecheville had in fact been obliged to sell his manor of Stavelev and other lands appurtenant thereto to the Earl of Devonshire [William Cavendish, 1640-1707] in the October previous to his death for the sum, it is stated, of £2,600. (Harl. MS. 6820, f. 100). This was afterwards made the subject of much litigation by Culpeper. He used every means in his power to set aside the sale, and, exasperated by repeated failure, he took occasion to publicly insult his opponent by striking him within the precincts of the court at Whitehall, on 9 July 1685. The assault was witnessed by Evelyn (Diary, 1850-2, ii. 227). For this offence Culpeper was imprisoned in the marshalsea, and subsequently condemned to lose his hand. His wife's devotion alone saved him. Her letters to him during his imprisonment (Harl. MS. 7005) and the account of her efforts to procure his release are deeply pathetic. At her entreaty Lord Danby used his influence with the king, and Culpeper was pardoned. After Monmouth's defeat, Culpeper for some reason was encouraged to show himself at court, where he would in all probability have obtained some minor office. But on the evening of 26 April 1687, the Earl of Devonshire, encountering him in the Vane Chamber at Whitehall, while the king and queen were in the presence, challenged him to walk out, and on Culpeper's refusal struck him with his cane (Bramston, Autobiography, Camd. Soc., pp 275, 278-9). It was now the earl's' turn to be imprisoned and tried. In the result he was fined £30,000. (Lords' Journals, April-May 1689), and in default of payment was committed to the king's bench, from which, however, he soon managed to escape, and in the next reign the fine was remitted (Collins, Peerage, ed. Brydges, i. 343). The sequel is recorded by Luttrell, who under the date of 1 Jul 1697 writes: "Yesterday the Duke of Devon meeting Coll. Culpepper at the auction house in St. Albans Street, caned him for being troublesome to him in the late reign' (Relation of State Affairs, iv. 246). Culpeper had now lost all hope of preferment at court, and, having sold his family estate in 1675, was left without provision in his old age. His wife had died on 3 Dec 1698, leaving no issue. The rest of his life is a dismal record, of want and sickness, of perpetual schemes for the amendment of his fortunes, by pretended discoveries of mines, and of various projects for the improvement of the army, navy, and revenue, besides inventions without number. He died at his lodging in Tothill Street, Westminster, in December 1708, and was buried on the 28th in the neighbouring church of St. Margaret (Burial Register). The Dictionary of National Biography. The Concise Dictionary, London: Oxford University Press, 1953. Part 1, From the beginnings to 1900. (Reliquary, iii. 152, 154-6, xii. 27-32; Gent. Mag. lxvii. i. 477, ii. 563, xcvii. ii. 296 ; Luttrell's Relation of State Affairs, i, 401, iii. 197; Nichols's Collectanea, iv. 6, 6, 210, 213, 218, 384, 386-8; Wilson's Hist. of St. Laurence Pountney, p. 240 n (d) ; Cal. State Papers (Treas. 1702-7), p. 223 ; Harl. MSS. 6819-20, 7005, 7559-62 ; Addit. MSS. 11324, 28094, p. 127; Will of Lord Frecheville, reg. in P.C.C. 155, Cottle; Cal. State Papers (Dom. ), 1660-7). E-mail written 2003, 2010 to Warren Culpepper from Helen Thorpe Wright (desc of #8680), e-mail address. "England, Kent, Canterbury Parish Registers, 1538-1986," database with images, FamilySearch (https://familysearch.org/ark:/61903/1:1:QGN2-JFCP : 13 March 2018), John Thorpe and Elizabeth Cullpepper, 09 Sep 1618; from " Kent, Canterbury Archdeaconry Parish Registers Browse, 1538-1913," database and images, findmypast (http://www.findmypast.com : n.d); citing Marriage, St Laurence in Thanet, Kent, England, United Kingdom, page , Citing Canterbury Cathedral Archives, England. In the name of God Amen this tenth day of October Anno Domini one thousand six hundred and five. I John Thorpe of Worth in the country of Sussex gentleman being sicke in body but of good and perfect memorie praised be God therefore daily [expertinge] the dissolution of my aged and fraile fleshe, hereby utterly revoking all former wills by me heretofore made, doe nowe make and ordaine this my last will and testament in manner and forme following. First I commend my soule in to the hands of the Almightie, and my most mercifull God…… [hopinge] to be saved by the … … and passion of my saviour Christ …., my body I leave to the earth from whence it was taken to be ….. buried at the [direction] of my ….., And as for the …inge of that temporall state which it hath pleased God to …… uppon me. First I doe give and bequeath unto the poore of the parish of Worth the some of fortie shillings to be distributed at the discretion of [Maithew] Linton parson thence and myne executors hereafter named. And to the repairing of the Church of Worth the some of Twentie Shillings to be bestowed by the discretion of the churchwardens there for the tyme beinge, both those somes to be paid within two months after my decease. Item I give and bequeath unto the poore of the parish of Horne the some of fortie shillings to be distributed at the discretion of the parson there for the tyme being and of my executors. Item I give the some of twentie shillings to the repairing of the parish church of Horne, to be bestowed by the discretion of the churchwardens theire for the time being and by myne executors both which somes to be paid within two monthes after me decease. Item I doe give and bequeth to Richard Thorpe, George Thorpe, William Thorpe, and Alice Thorpe the [fewer] children of my sonne Thomas and to John Turner the sonne of Mercie my daughter the wife of George Turner of Lingfield, to each of them the some of one hundred pounds to be paid to theize …. within two years after my decease uppon suriety given to myne executors hereafter named that their severall portions shalbe [finlit] paid unto them severallie, at their severall ages of one and twentie years, and imployed in the mean tyme for theire severall proffitte and benefitt. Item I give to Thomas Thorpe my sonne my whole lease or terme of years in Hedgecourte, and all the landes thereunto belonginge, and all things conteyned in the same lease for the whole term or number of years therin yet to come and ….. except the last yeare of the paid terme only if he the said Thomas Thorpe my sonne shall for longe lyve, the residue of the said terme I give and bequeath unto the eldest sonne of the said Thomas Thorpe, which shalbe living at the tyme of the [decease] of the said Thomas my sonne. Item I give unto Gyles Thorpe my sonne the some of fiftie pounds to be paid unto him within two years after my decease. Item I give unto my sister Julian Wood the some of five pounds and to her daughter Margarett, the some of five pounds, and to John [Stanley] sonne of the said Julyan the some of five pounds, and to one other brother of the said John Stanley dwelling in [Somthmarke] a joyner the some of five pounds to be paid unto them within one year after my decease. Item I doe give unto my said daughter Marey Turner the some of fiftie pounds to be paid unto her within two years after my decease. Item I give unto Richard Ledger my servant the house wherin he [once] dwelleth and the lands thereunto belonginge now in the occupation of the said Richard Ledger himself and also all that parcell of grownde parcell of [covinglye] now in the occupation of one William Blundell or his assigns for the terme of fifteen years next after my decease payinge therefore yearly during the said terme the yearly rent of five pounds at the usuall feastes of Saint Michaell the Archangell, and the annunciation of the virgin Mary in equal portions, To such person or persons as shall have the estate and interest of and in my lease of Hedgecourte duringe the said terme by force of this my will Item I will and bequeath unto Andrewe Turner my servant the house and lands now in his tenure and occupation, for the terme of fifteen years, [nigh] after my decease, payinge therefore yearly during the said terme the rent of five pounds at the two feastes stated aforesaid, to my person or persons as shall have the estate and interest in my lease of Hedgecourt during the said terme, Provided allways and uppon condition that the said Richard Ledger and Andrew Turner, and their severall Executors and administrators shall severallie [lease] their severall houses and lands to them devised as aforesaid during the said terme with convenient [reporations] and [in…res], and shall not comitt any volountary [wast] in any parte of those premisses to them demised as aforesaid nor dispose of the said houses and lands, to any other person or persons, then to their severall wives or children, without the speciall virtue of such person or persons as shall for that tyme have the estate and interest in my said lease of Hedgecourte first had and obtained . Item I give to John Wallis of [New]digate the elder, my farmer, the some of tenne pounds, and to John Wallis his sonne my servant the some of fortie shillings to be paid unto them within one year after my decease. Item I give to Ellenor Ledger my goddaughter the some of fortie shillings to be paid unto her within one year after my decease. Item I give to Edmond Robinson servant to my sonne Thomas Thorpe fortie shillings to be paid within one year after my decease. Item I doe give to the widdowe [Nicholas] servant to my daughter Thorpe at Hedgecourt, the some of five pounds, to be paid within one year after my decease. Item I doe give to Anne [Top]field servant to my sonne Thomas twentie shillings to be paid within one year after my decease. Item I doe give to Thomas Boorer servant to my sonne Thomas fortie shillings to be paid within two years after my decease. Item I doe give to George Ashburner the sonne of Edward Ashburner of [Greene] in Sussex the some of tenne pounds to be paid when he shall have accomplished his full age of one and twenty years. Item I give unto Alice Ashburner sister by the said George the some of five pounds to be paid unto her at her daye of marriage or when she shall have accomplished her age of eighteen years, which of them thait first happen. Item I doe give to John [Topner], and to fortie foote, and to Robert [Rawling] servants to my sonne Thomas, to each of them fortie shillings, to be paid within four years after my decease. Item I give unto Richard Thorpe my grandchild the sonne of my eldest sonne John Thorpe, the some of three hundred pounds to be paid unto him and his age of threee and twenty years, upon condition that the said Richard Thorpe doe before the ret…. thereof make unto John Thorpe his brother a sufficient …case and discharge in [lewe] of all such rents Annuities … estates, as I have heretofore granted or assigned, or caused to be granted or assigned to him or to his use out of the Manor of farme of [Cridworth], or out of my lands in [Nri]digate or any other my lands in the county of Surry. And if it shall happen the said Richard Thorpe to die before his age of three and twentie years, then my will is that the said three hundred pounds shall be paid unto George Thorpe, and William Thorpe the sonnes of Thomas Thorpe my sonne, and to Alice Thorpe daughter of my said sonne Thomas or the survivor of them equallie. And my will and meaning is that the said some of three hundred pounds shall be delivered to myne executors hereafter named within one year after my decease to my trustie friends John [Delathamber] of Rodmell in the county of Surrey gentleman, George Turner of Lingfield in the county of Sussex gentleman, Anthony Linton of Worth in the said county of Sussex, [Clerke], and Richard Heath of [Lewis] in the said county gentleman or to the survivor of them they [puttinge] in sufficient bond unto myne executors to repair the same according to this my will uppon special trust and confident that they shall employe the same to the benefit of the said Richard Thorpe my grandchild accordinge to their good directions . Item I give to Alice Thorpe my grandchild, the daughter of John Thorpe my eldest sonne the some of one hundred pounds to be paid unto her at her age of eighteen years or day of her marriage which of them shall first happen, and my will and meaning is that the said some of one hundred pounds shall be delivered unto the said John [Delathamber] in one year after my decease uppon surietie given to myne executors to discharge him for the best benefit of the said Alice. Item I give to my sonne John Thorpe [although] his behaviour unto me hitherto hath [defered] not remeberance of him at all the some of one hundred pounds which my will is shall not be paid or delivered unto him self but shall be delivered and paid unto my good friends aforesaid John Delathamber, George Turner, Anthony Linton and Richard Heath or the survivor of them within five years after decease, by them to be disposed for his maintenance at their good directions. And as [for to] [mirthe] of my said will as E…nith the disposinge of my lease of Hedgecourt and althings therein to belonginge I make my said fewer friends John Delathamber George Turner, Anthony Linton and Richard Heath myne Executors. And as concerning the residue of my said will I make and ordaine my sonne Thomas Thorpe my sole executor unto whome after my depts and legacies paid and funeralls in convenient and decent [forte] performed I give the residue of my goodes and chattells not bequethed. And I [intriate] my said former friends to be my overseers to that parte of my said will, and I give to each of them the some of five pounds of current money to be bestowed by [everie] of them at their directions for a remembrance of me. And further my will and meaninge is that my said executor Thomas Thorpe shall put in bond with two sufficient [sureties] unto my said overseers or to the survivor or survivors of them with condition for the true performance of this my last will, before he take upon him the [execution] thereof or as my will unto him to be void. In witness of which my last will, I have left my hand and seale and published the same in the presence of the whole named are underwritten, By me John Thorpe, Robert Heath [junior] John Greene. I John Thorpe [of worth] in the county of sussex gentleman beinge in good and perfect rememberance thanks be to almighty god this eighteenth of February one thousand and six hundred and sixe doe add and annexe this Codecill followinge unto my last will and testament aforesaid in manner followinge, That whereas William [En]ssell, and Edmonde Gammon citizens of London doe owe unto me the some of five hundred pounds for whith they have given their bond of one thousand pounds unto John Delathamber of Rodmell in the county of Sussex gentleman, dated the five and twentieth daie of August now late past, [it] was and is intended to the use of me the said John Thorpe, [onely]. And whereas Gyles Fleminge and Edmond T[urwill] citizens and executors of London doe owe unto me the some of [four] hundred and forty pounds payable of the feast day of St. Michaell the Archangell now next [ensuinge] by their hand dated the first and twentieth of August now last past. All [these] somes of money amount in all to nyne hundred and fortie pounds, my will and meaning is that my trusty friends John Delathamber George Turner Anthony Linton and Richard Heath inmy said will mentioned shall have and [receive] the said severall somes os for minth thereof as my self in my life tyme shall, not imploye or bestowe to the … hereafter mentioned to the intent and purpose that they of the survivor of them or their executors or administrators shall dispose and have out the same and br…ye therein at their good discretions, [from] the lands tenements herediments as they can pr..ise and purchase for that money, and shall cause the same to be conveyed and assigned unto the use of John Thorpe eldest sonne of my sonne John Thorpe and of the heired males of his body lawfully begotten, and for lack of such issue, to the use of Richard Thorpe second sonne of John Thorpe my sonne, and of the heires males of his body lawfully begotten and for lack of such issue to the use of Richard Thorpe sonne of my sonne Thomas Thorpe and of the heires males of his body lawfully begotten, and for the lack of such issue to the use of George Thorpe second of my said sonne Thomas Thorpe, and of the heires males of his body lawfully begotten, and for lack of such issue, to the use of William Thorpe third sonne of my said sonne Thomas and of the heires males of his body lawfully begotten, and for lack of such issue to the use of Gyles Thorpe my sonne and of his heires for ever. And I doe further give and bequeath unto the said John Thorpe my grandchilde my silver salt …., a silver goblet and a silver beaker, a bedstedle, and a fether bed.. ….. cob…tt blanketts and all other ….. thereunto belonging to be delivered unto him at his age of four and twentie years, and if he dye before that age, then I give the same to his brother Richard Thorpe, at his age of four and twentie years, and as to those somes of money and plate conteyned in this my codicill I make and ordaine my said former friends John Delathamber George Turner Anthony Linton and Richard Heath myne executors, and none other. And to this my codicill I have subscribed my name, and published that same in the presence of theise whose names are underwritten. By me John Thorpe witnesses to the publishing of this codecill Richard Heath John Greene John Wallis. From "Collections Relating to the Family of Crispe" Vol.4; by Frederick Arthur Crisp 1893. The book can be found and downloaded at archive.org. Courtesy of Peter W. Kuhlmann. Biography* � Richard Culpeper, the elder of two brothers with that name, was the son and heir of Nicholas Culpeper, and Elizabeth Wakehurst, his wife. Will* 6 Sep 1539� He made a will at Ardingly, co. Sussex, England, on 6 Sep 1539. Tudor P.C.C. Will Transcription by L. L. Duncan - Book 54 page 37. Will* 1483� He made a will in 1483. Biography* � Edward Culpeper, B.C.L., D.C.L. (7 Mar 1505/6 ; B. Can L. and (? D. Can L.), 26 Jan 1506/7; D.C.L., 1 Jul 1510 of All Souls College; third son of Nicholas Colepeper, who died 1510 (2 Henry VIII). He was instituted Rector of Ockley, co. Surrey, 3 Aug 1514, Master or Provost of the Collegiate Church of St. Peter, Lingfield, 20 Jul 1524, and was alive 16 Apr 1544 (36 Henry VIII), when he acknowledged the receipt of £6. 13s. 4d. annuity out of the lands of the College of Lingfield, and during the four subsequent years, when he gave similar receipts. Biography* � Thomas Culpeper of Crawley, Esq., who from the Inq. P.M. of John Fenner and from the will of his uncle, Richard Culpeper, appears to have been married shortly before 1513 (when her younger son was aged four year) to Anne, the widow of Thomas Fenner, his son, who died shortly before his father. The will of John Fenner, the father, and Thomas Fenner, the son, were both proved in P.C.C. in 1513. John Fenner gives his messuage in Crawley with certain lands to Anne Fenner, late the wife of Thomas Fenner, his son, and nor;• the wife of Thomas Culpeper, for her life. She is also to have his lands in Ifeld called Bonewyks and Westland until her younger son, John Fenner, aged four years, shall attain the age of 21. 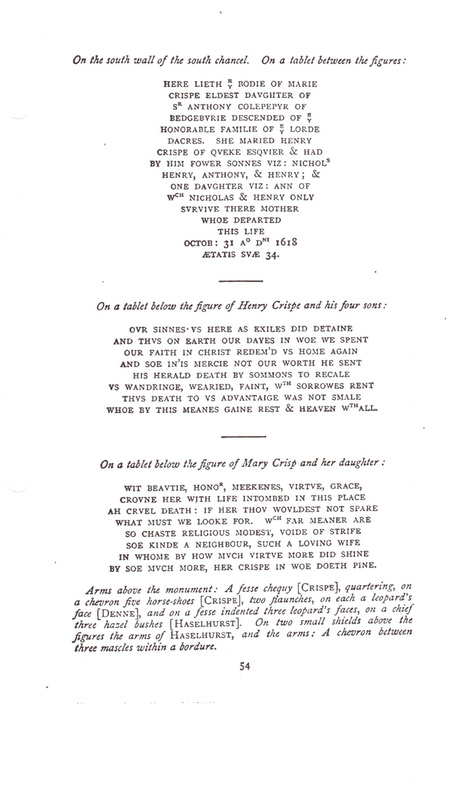 "Anne" describes herself in her will as "Joane," widow of Thomas Culpeper of Crawley, Esq., and as she mentions no Culpepers in it we may assume that she left no issue by her second husband. Her will is not dated, but was proved between 1541-1549. Her husband, Thomas Culpeper, is probably the defendant in an action, William Williams, clerk, versus Thomas Culpeper. Whether the said plaintiff made a lease of years of the parsonage of Burstow unto the said Thomas Culpeper or not and what rent the said Thomas should pay yearly and what chambers or any other things were reserved to the said person… and many other interrogatories. Among the evidence given is that of Thomas Busse of Burstow, carpenter. He says that he does not know whether the said William Williams, clerk, leased the said parsonage to Thomas Culpeper or not, but at the end of his evidence he says he knows and did see the said Thomas Culpeper come to the said Williams clerk for to have a mattock from him which he claimed to be his mattock and thereupon the said Thomas Culpeper and William clerk fell out and made a fray together, but who was in the fault, this deponent knows not. Thomas Bray, yeoman of Burstow deposed that he knows not whether the parsonage was leased to Thomas Culpeper or not "And he says that the said William clerk in the house of this deponent required the said Thomas Culpeper that he might have his rent of the said parsonage to him due, and thereupon they multiplied words together, and then the said Thomas Culpeper broke the brow of the said William, clerk, with the shaft of a knife so that the blade ran down his face in the presence of this deponent. And he says by the report of one William Playce and Robert Fulcher late of Burstow that the said Thomas Culpeper did assent the said William, clerk, to have a mattock from him which was the proper good of the said clerk, and then the said Culpeper gave the said William, clerk a blow or two with a staff for he was not able to sing mass for a fortnight after, and thereupon the said clerk plucked the said Culpeper down by the beard in the sight of the wife of the said Culpeper who with one or two of her servants came running to help to beat the said William clerk, so that he was forced to cry to the said William Playce and Robert Fulcher for aid. How be it the said Culpeper took away the said mattock by force, and by report the said Culpeper drew his dagger at another time to strike the said William, clerk, and more he cannot depose. Lewes A,1,16; S.A.C., Vol X, p 1. Will of Thomas Culpeper of Lowdham dated 12 Apr 1571, proved 4 Nov 1572, P.C.C. 35 Draper.